Australian-born travel blogger 'Being Erica' has recently returned from a trip to Croatia. She ventured to the Split Riviera, a place of rustic beauty fused with a contemporary style. You can discover over 2,000 years of history and Split is listed as a UNESCO world heritage site. These are some of the things you can expect when staying in a Clickstay apartment in Seget Donji. What was Seget Donji like? It was GORGEOUS! It was about half an hour out of Split and only 20 minutes walk to Trogir, so we had lots of options of doing and seeing things. Really beautiful area. What was it like to stay in the apartment? We barely spent any time in it as we were too busy exploring every day, but the apartment was clean and comfortable, and the area was really quiet too. How close was the property to shops/restaurants? There was a small shop within a five-minute walk and then bigger ones about 15 min walk away. We did a big shop so we had food in every day for lunches so we just went out for dinner. There were some really lovely restaurants within a ten-minute walk of the apartment too, so we were never too far from food and drink! What was the cuisine like in this part of Croatia? Just DELICIOUS. All the fresh seafood and pasta and pizza you could want! You were close to Split, how easy was it to go there for a day trip? We had a car, so very easy! There is also a water taxi from Seget Donji that goes to Split via Trogir, so that's an option too. Did you eat out all the time, or did you cook in the apartment? We ate out for dinner, then had cold meat and cheese for lunches. The kitchen in the apartment was very small and not really ideal for cooking in, which was fine as I don't like cooking on holiday! On the advert, it says you are 30m from the beach, what was it like being so close to the sea? If you were to choose one thing for someone to do in this part of Croatia, what would you recommend? Definitely, head to Krka National Park to see the waterfalls, or take a boat trip out to the islands. Which Clickstay property would you like to stay in next? Hopefully one big enough for all the girls in somewhere sunny like Greece or Cyprus! This is the glamourous one-bedroom apartment Erica stayed while staying in Croatia. It's a luxurious property, within walking distance of the sea. 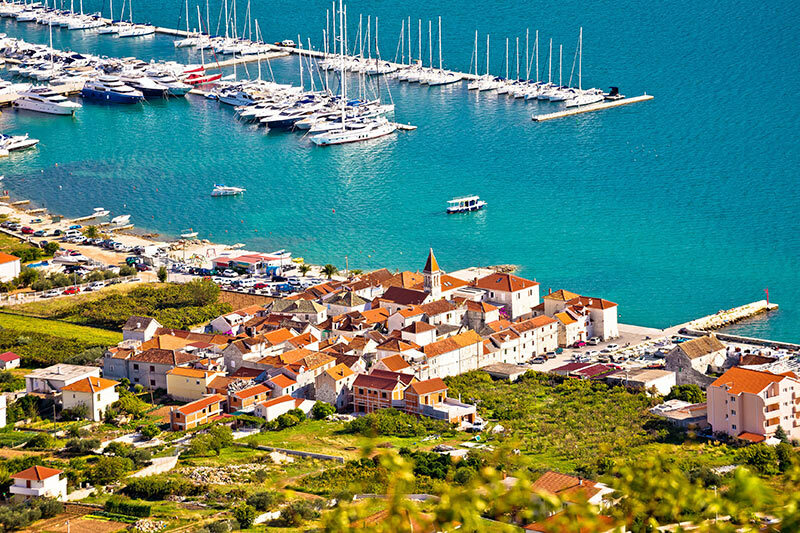 It's located in a fishing village named Segit Donji, just a few minutes from the historical city of Trogir and the town of Split.